Preparation time: 5 minutes. Baking time: 45 minutes. Standing time: 10 minutes. Preheat oven to 350°F and coat a 9″ pie plate with cooking spray. 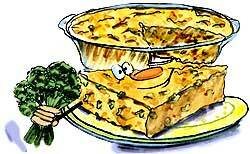 Combine the potatoes, cheese, vegetables, skim milk, eggs, salt, and pepper in large mixing bowl and stir well. Pour the mixture into the pie plate. Bake, uncovered, for 45 minutes or until a knife inserted in the center comes out clean. Let stand for 10 minutes before slicing into 4 wedges. Exchanges per serving: 2 starch, 2 lean meat, 1/2 vegetable. Carbohydrate choices: 2.